Trees are a significant part of our landscaping. Whether only one is planted at a time or many are planted at once, they must be planted properly or the tree will quickly die. If the tree is required by a city ordinance and dies, you will be required to replace it, so it is beneficial to plant the tree properly the first time. When you need assistance with new tree establishment in Gainesville, contact SkyFrog Tree Service. When you are planting new trees, federal and local regulations require certain standards to improve the likelihood that they will survive. The tree that is being planted must have a diameter of at least two inches, and it needs to have been grown in a container or balled-and-burlapped. Because soil is so integral in providing trees with nutrients, it must first reach satisfactory standards before the tree is planted. The soil should have a pH level somewhere between 5.8 and 7.0, and have at least 5 percent organic matter. It will also need to be aerated eight inches beneath the topsoil. The actual hole that you place the tree into must be about two to three times larger than the root ball itself and can’t be less than three feet in any one direction. The hole should not be deeper than the root ball and it should be either slightly above the ground or just beneath the surface. Often when land is developed to build new office buildings, the government will require you to plant a certain number of trees. It should be noted that out of all of the new trees, only 30 percent are permitted be the same species. If you are planting trees in a parking lot, you will need to choose tree species that are ideal for that setting. These trees will also need to have sufficient soil surface area or your tree may become stunted. For example, very small trees require at least 25 square feet of exposed surface area while large trees require at least 400 square feet. Research has shown that trees can cause a 4 percent to 27 percent increase in the value of your property. If you are planting a new tree in your front lawn, keep in mind that it is better to plant smaller trees as they require less time to become established, cost less and have a better chance of surviving. You will also need to set aside the required time to lay mulch, irrigate the tree regularly, and apply fertilizer. When establishing a new tree, it will need a fair amount of care afterwards. Remove any dead and broken branches when you place it in the ground. The new tree must be watered every day for two months and then once every two days for three months. After this time period, you can reduce it to once a week. You must also apply two to three inches of fresh mulch in a circle around the base of the tree with a diameter of two feet. This helps prevent other plants from competing for nutrients or water. 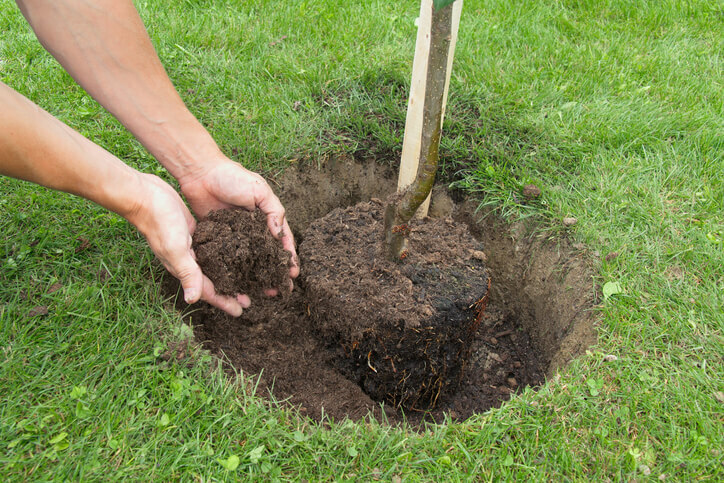 One month after you plant your tree, fertilize it with slow-release nitrogen. When trees are first planted, they are extremely fragile and vulnerable to drought, disease and pests. If poor techniques are used to plant your tree, it will have no chance of survival. That is why it is vital to contact a Gainesville arborist. Arborists know the most recent techniques and practices for tree establishment to increase the chances of successfully establishing your tree. An arborist can effectively plant your tree and inform you about proper care afterward. What Is Transplant Shock Syndrome? Transplant shock syndrome is the collective term referring to several stresses a tree can display after being transplanted to a new location. Unless the stresses are discovered and treated early, the overall health and strength of a tree can quickly diminish. A common contributor to this condition is transplanting a tree out of season or during a time of year that isn’t supportive of re-establishment. It’s possible to transplant a tree yourself, but when in doubt, call SkyFrog Tree Service for professional tree service Gainesville residents have relied on for years. Our team works with you and creates a transplant plan that reduces the chance of damaging the surrounding landscape and the tree itself. Why Transplant When A Tree Is Dormant? When a tree is dormant, it’s essentially in hibernation. The need for nutrients and water decreases which means the tree is less likely to be affected by transplanting. Plus, transplanting a tree before the growing season begins allows it time to re-establish the root system which places it in a position for continued growth. Our arborists can evaluate the health of a tree in question and advise you of the time frame that the species will be dormant. However, the signs of transplant shock vary from tree to tree. If you suspect a tree is suffering from these symptoms, contact a Gainesville arborist with SkyFrog Tree Service. Most issues with a transplanted tree are related to root damage during the uprooting process. It’s not uncommon for the majority of the root system to be lost or damaged which forces the tree to use its nutrients and water to regrow the system. If your tree appears stressed, start by allowing at least one inch of water to soak into the root system each week. Also, add a deep mulch layer — up to four inches deep — several inches from the base of the tree to the outermost leaves. This will lessen moisture evaporation from the root system. As with any type of Gainesville tree care, the biggest key to keep in mind is patience. Depending on how stressed a tree is when the recovery process begins, it may take up to five years for the tree to fully recover. If you are looking for an arborist in Gainesville, FL, choose SkyFrog Tree Service. We have several arborists on our staff and more than 40 years of experience to provide you with superior results. If you are considering adding a plant to your residential or commercial property, contact our office today to learn more.